Under the command of Vojvoda (Field Marshall) Radomir Putnik, the Serbian Army defeated Austro-Hungarian invasions in August, September, and November of 1914. During the campaigns, Serbia had lost 132,000 men, with 22,000 dead, 91,000 wounded, and 19,000 captured or missing. On December 15, 1914, the Serbs retook their capital of Belgrade. France and Britain did little to aid it. Most of 1915 is quiet. No aid to Serbia. As 1915 began, Serbia suffered from a typhus epidemic. Approximately 200,000 strong at the beginning of the war, the Serbian Army was battle-hardened from the First and Second Balkan Wars of 1912 and 1913 and the 1914 campaigns, but had limited artillery and machine guns. In early 1915, anticipating war with Bulgaria, Putnik created two new armies. The Timor and Macedonian Armies flanked the Second Army facing Bulgaria to the east, the former on the left wing of the Second, the latter on its right. Having few additional men, Putnik chiefly drew upon his existing forces to create the armies, and, as in 1914, still had limited supplies. Landlocked, Serbia's allies had little access to the country. Neutral Bulgaria lay to its east, neutral Greece to its south, its enemy Austria-Hungary to its north. Serbia was accessible only through its ally Montenegro to the west, a mountainous country with a short Adriatic coastline. 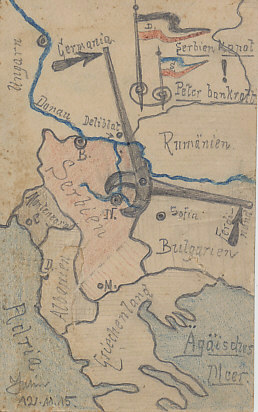 Focused elsewhere, its allies provided little aid to Serbia throughout 1915. Italy's entry into the war in May had created a new front, but one that Austria-Hungary held. France and Britain opened a new front in the Dardanelles and Gallipoli campaigns, but it became, like the Western Front, a stalemate. The two countries, particularly Britain, were attempting to resolve the shell shortage that stymied their spring and fall offenses. From May onward, their ally Russia was being driven east by the joint German-Austro-Hungarian Gorlice-Tarnow Offensive. As that campaign removed the Russian threat to his Austro-Hungarian ally, German commander Falkenhayn, turned his attention to dealing with Austria-Hungary's threat from the south, Serbia. Having signed a secret treaty with Germany and Austria-Hungary, Bulgaria began mobilizing on September 23, 1915, and positioned its two armies along its border with Serbia, the First Army of 200,000 under General Boyadjieff facing west and threatening the Belgrade-Sofia rail line; the Second of 100,000 under General Teodoroff facing Macedonia and the Serbian communications hub of Uskub. Serbia had 100,000 men facing these forces. Learning of Bulgaria's mobilization, Britain and France feared for Serbia, and each rushed one division from Gallipoli, landing 13,000 French and British troops land at Salonica, Greece on October 5, 1915. [October 3, says map 48.] Greece was neutral, with its government divided between the pro-German King Constantine and the pro-Entente Prime Minister Eleftherios Venizelos, and the landing was tantamount to an invasion. Under General August von Mackensen, the joint German and Austro-Hungarian invasion of Serbia began on October 6, 1915, with a heavy bombardment of the Serb capital of Belgrade and other positions along the Danube, Drina, and Save Rivers that shaped Serbia's northern border. Austria-Hungary had struck the first blow of the war on July 29, 1914 by bombarding Belgrade the day after it had declared war on Serbia. Mackensen's invasion began along Serbia's northern border, with the Austro-Hungarian Third Army under General Hermann Kövess von Kövess Háza crossing the Save River west of Belgrade, and the German Eleventh Army commanded by General Gallwitz east of the city across the Danube. Mackensen took Belgrade on October 9. The Serbian government and the diplomatic corps fled to the city of Nish. Serbian forces inflicted casualties of as much as 20% on German and Austro-Hungarian forces invading along its northern and northwestern border. Mackensen also commanded the Bulgarian First Army, which invaded across Serbia's eastern border on October 11. [Gilbert, p 204; Map 48] The Bulgarian First Army targeted the city of Nish, the seat of government in 1914 while Belgrade had been occupied???. The Bulgarians??? took Nisch on November 5. Two Bulgarian armies – two, Zhekov in command??? invaded from the east, by Ferdinand??? [Herwig page 179] Mackensen take 150,000 prisoners in October. Tenaciously battling the German and Austro-Hungarian forces that had invaded the country on October 6 and seized the capital of Belgrade the next day, Serbia had approximately 100,000 troops to defend its eastern border. By October 14, Bulgarian forces invaded Serbia, threatening not only the Serbian government that had fled to Nish, but more importantly the rail line from Serbia to Greece and the potential for men and supplies from the Anglo-British forces that had recently landed at Salonika. From Belgrade, the railway ran to Nish, where one branch forked east to Sofia, capital of Bulgaria, and the other continued south to Uskub. South of the First, the Bulgarian Second Army prevented Allied relief of Serbia. Commanded by Bulgarian General Teodoroff, the army of 100,000 men invaded Serbia on October 11 to seize the railway center of Uskub, and to prevent an Allied advance from Macedonia along the rail line or the valley of the Vardar River. On October 19 the Bulgarians reached the Vardar River, on the 20th they took Veles, Skopje on the 22nd, and by the 23rd had cut Serbia's railway communications with Greece. They drove back forces led by French General Maurice Sarrail which were trying to advance up the Vardar. The Allies established a position at Lake Doiran, On the border of Greece and Serbia, but the Bulgarians drove them from it on December 3. Since the beginning of the war, refugees had fled the fighting, many of them to Jagodina, 130 km. south of Belgrade. As Serbia's plight worsened, refugees, many in need of food, clothing, and shelter, poured into the city. With retreat to the south and the Allies in Greece cut off, the government determined by October 25 to retreat to the west across Albania to the Adriatic Seaand evacuation by France, Britain, and Italy. The mountain passes were already covered in snow. German and Austro-Hungarian submarines from the ports of Pola and Cattaro threatened Allied shipping in the Adriatic. Italy was ambitious for territory along the eastern Adriatic shore, but fearful of naval losses in the Sea. On November 22, the Italians occupied Valona, Albania. The temporary capital of Nish fell to the Bulgarians on November 7. The Serbs fought desperately to protect their lines of retreat. In Macedonia, 10 miles from the French forces attempting to reach them, Serbian soldiers held the Babuna and Katshanik Passes, a force of only 5,000 holding the former against 20,000 Bulgarians in the first week of November. In central Serbia, the main Serbian force and 100,000 refugees were on the Kosovo Plain, where the Battle of Pristina was fought on November 13 in driving rain. Vojvode Putnik ordered his army to retreat from Serbia on November 25. Some military commanders debated instead disobeying the Marshall's order and launching a counter-attack on the German and Austro-Hungarians facing them, but their forces were dwindling with deserters joining the retreat to the west, or otherwise leaving. Retreating through the mountains of Albania in winter, and bringing with them Allied ministers and 24,000 Austro-Hungarian prisoners, they were bombed by Austro-Hungarian aircraft, and attacked by Albanian brigands. They reached Scutari, Albania on December 7, and continued to the coast, with between 100,000 and 150,000 reached the Albanian coastal cities of Durazzo and Valona. The Allies were again too late to aid Serbia, and neither food, nor shelter, nor transport awaited them at the coast. Nor were the Serbs safe in Albania. The Central Power offensive had included an invasion of Montenegro beginning on October 9, primarily by Austro-Hungarian troops that took Centinje, the capital on January 13, 1916. Montenegro requested an armistice and dropped out of the war, although King Nicholas fled to Rome and ultimately France to establish a government in exilt. In a move that angered the German high command and infuriated Bulgarian Tsar Ferdinand, Conrad continued the Austro-Hungarian advance and moved into northern Albania, taking the border city of Skadar on January 23, 1916. The Serbian struggle continued. The Italians initially tried to keep them from Valona. Threatened by the Austro-Hungarian invasion of Albania, the Serbs resumed their retreat, heading south to the ports of Durrës and Vlorë, marching up to another 250km. At the end of December, 1915, there were 112,000 Serbian troops on the Adriatic coast. By January 15, 1916, the French had transported only 15,000 troops to safety on the Greek island of Corfu, leaving another 140,000 in peril. It would be some time before Corfu had adequate food, shelter, and clothing for the Serbs, and spring before the French Navy had completed transporting them to Corfu. Of the 200,000 Serbs, military and civilian, who had set out, 20,000 were lost. Returned to health, rebuilt, and resupplied, the Serbian army was ultimately moved to the left wing of the Salonica front, and would take a significant part in liberating its country. Conrad's invasion of Albania infuriated Austria-Hungary's allies. Falkenhayn stopped communicating with Conrad, his Austro-Hungarian counterpart who wanted to annex Serbia, Montenegro and Albania. 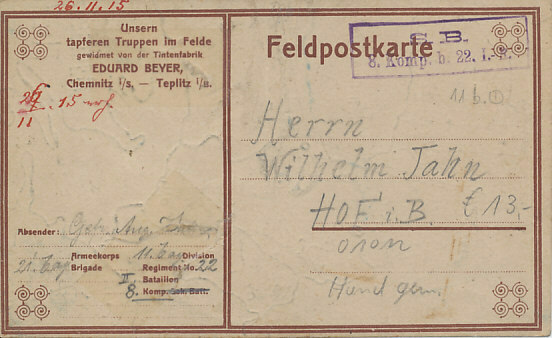 In response, Conrad halted German shipments to Bulgaria. Bulgarian Tsar Ferdinand returned medals Austria-Hungary had awarded him, and threatened war against Austria-Hungary. From December 22, 1915 to January 19, 1916 Conrad and Falkenhayn refused to communicate. With Bulgaria as an ally, and with Serbia occupied, the Central Powers divided Europe from the Baltic Sea to Mesopotamia. The Berlin to Baghdad Railway was closer to reality, and Germany could more readily transfer troops and supplies to Turkey. On January 1, 1916, the first train from Berlin arrived in Constantinople. Though the Allies debated keeping troops in Salonica, they steadily built up the forces there. The Serbian Army was part of an international force that included French, British, Russian, Greek, and Italian troops. On the Salonika front, French General Franchet d'Esperey, commanding that army, found the breakthrough force he was looking in the Serbian Army.